Raian, based near Loveland CO, has been teaching and training riders, horses, and companion animals since the ’80’s. She uses bodywork to improve animals’ balance, self-awareness, and self-control, as well as to increase the connection between horse/animal and rider/handler. Apart from being an Equine and Canine Touch and VHT International Instructor (and still horse-crazy girl at heart), she is a TTACT and TTEAM Practitioner III, a certified veterinary assistant, and member of NAHA, ARIA, CHA, IEEE and other associations. She works with all breeds from pony to draft, gaited and non-gaited, in disciplines both English and Western. Her current herd at home includes Appaloosas (Jock’s favorite 😉 ) and gaited breeds. And donkeys! She holds a B.S. degree in Electrical Engineering and Computer Science. 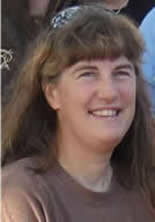 Raian runs the Equine Touch National Coordination Center (ET NCC) for the USA and Canada, and is currently Secretary for the International Equine Touch Association (IETA) in the USA.